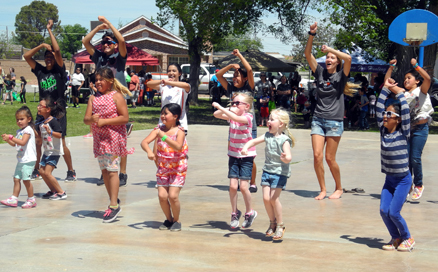 Above, participants in a spontaneous Zumba demonstration get loose and moving Saturday during the Child Safety Fair at Guadalupe Park. The seventh annual event drew a record crowd, according to Artesia Police Department Cmdr. 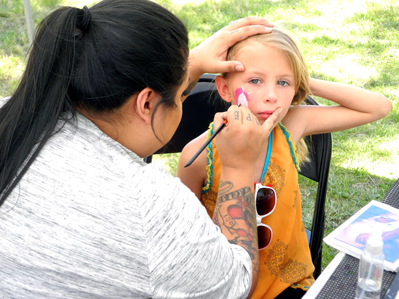 Lindell Smith, and mixed family fun, including face painting and games, with information from the APD, Artesia Fire Department, and other sponsoring agencies and businesses on how to keep kids safe and healthy. 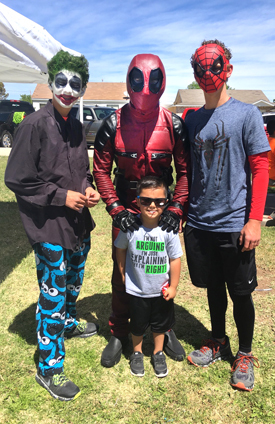 At right, 4-year-old Bryson Mathews poses with the Joker, Deadpool and Spiderman during the Seventh Annual Child Safety Fair Saturday in Guadalupe Park. 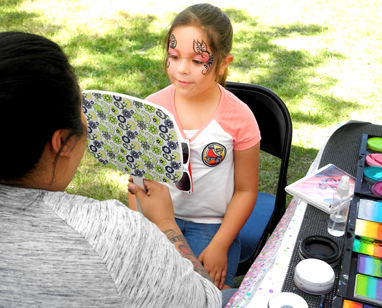 The youngster also had the opportunity to pose with the Artesia High School Bulldog mascots, prompting him to inform his mother he’d had the “best day of his life.” The sentiment was likely mutual for the abundance of children who took part in a variety of games and activities at the fair, such as Sayuri Guerrero, 7, below, and Cheyenne Cook, 6, at bottom, who had their faces painted in colorful butterfly and unicorn patterns.